Now more than ever, chemical industry stakeholders with shared business and advocacy interests are urged to consider collaborating on regulatory, testing, and related advocacy opportunities. Two years post-passage of the Frank R. Lautenberg Chemical Safety for the 21st Century Act means the U.S. Environmental Protection Agency (EPA) is well underway with implementation of the amended Toxic Substances Control Act (TSCA). Industry groups that are already established and working efficiently when EPA initiates an action under TSCA will be most successful in nimbly and effectively engaging immediately. Groups that have yet to organize will deplete valuable limited time to form, leaving little time to comment effectively and comprehensively on EPA’s proposed action. TSCA is by far not the only game in town. Companies should consider the benefits realized when organizing around advocacy and implementation effort pertinent to other regulatory initiatives such as Federal Insecticide, Fungicide, and Rodenticide Act (FIFRA) data call-ins (DCI), food and drug initiatives pursued by the U.S. Food and Drug Administration, and a wide range of state-specific programs. 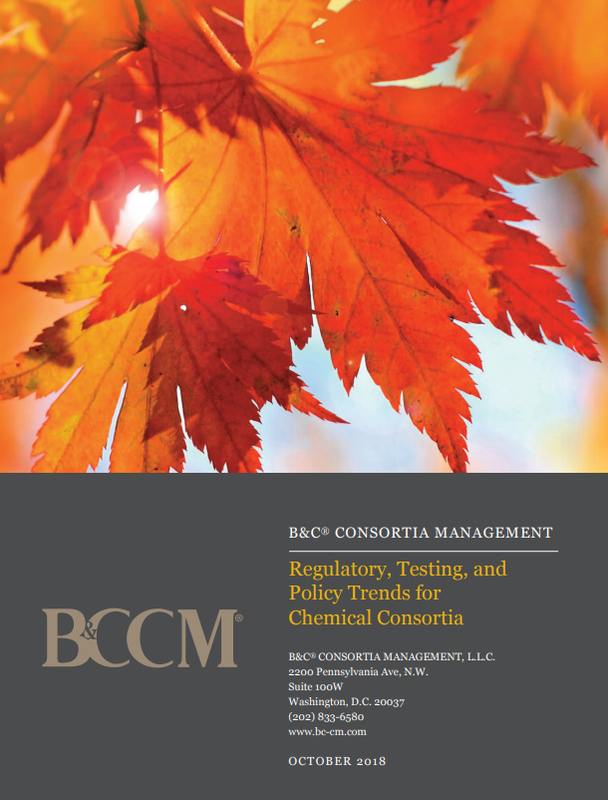 This year’s B&C® Consortia Management, L.L.C. (BCCM) forecast highlights our groups’ interests and activities on these and other issues that can and should be addressed under a consortia canopy. While we enjoy sharing our success stories, the goal of the forecast is to highlight the critical importance of leveraging resources by sharing the load through organizing groups of interested stakeholders, to summarize activities pertinent to our existing BCCM consortia, and to encourage you to consider allowing us to help with the formation of a new group to address issues of particular interest.